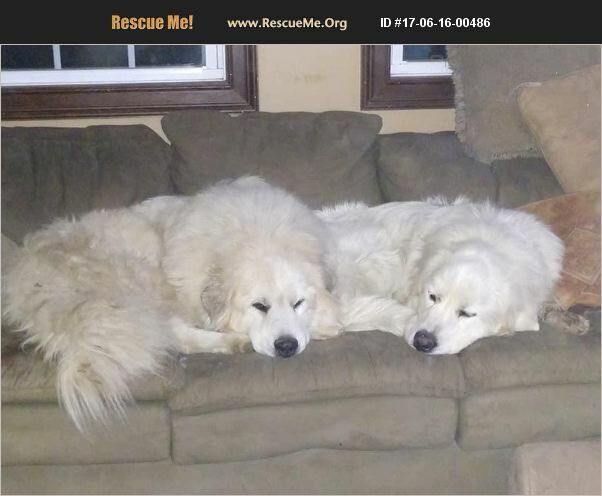 Massachusetts Great Pyrenees Rescue View other Great Pyrenees for adoption. Alexander (on the left) is a 3 year old neutered male. Good with kids, people and other dogs. He is good around farm animals and like his buddy, Teddy, in this couch picture he is looking for a home. He is NOT a Livestock Guardian Dog ( Which is a working dog that stays with the animals 24/7. He prefers to be with his people. He would make a great Family Farm dog where he could hang with you. Adopt Alexander and his buddy Teddy and we will give you a discount on the adoption fee of $350 each. If they can stay together we will only ask $350 for the pair. If you are looking for a Livestock Guardian Dog check for breeders on the Great Pyrenees Club of America site. www.gpcaonline.org LGDs are not cheap. A trained dog can cost you but your livestock cost you more. Are they not worth it? Rescue dogs and house dogs can kill your stock. It is rare that we get them in unless a farm is going under fast or a farmer suddenly dies. If you are interested in one of our dogs please go to our website and fill out an adoption information form. http://www.nepyresq.org Answer all questions. Put no or N/A if not applicable. Then a volunteer in your area will contact you to come meet you. After the home visit the adoption coordinator will put you in contact with the foster family of the dog(s) you are interested in that are available at the time you pass your visit. . We do not have a kennel in Lee, Mass.When you meet the dog if there is a connection then you will fill out an adoption contract and take you new family member home.